This week the VFUA has the pleasure of sitting down with long serving goal umpire Chris Doyle ahead of his 100th VFL game at Victoria Park. 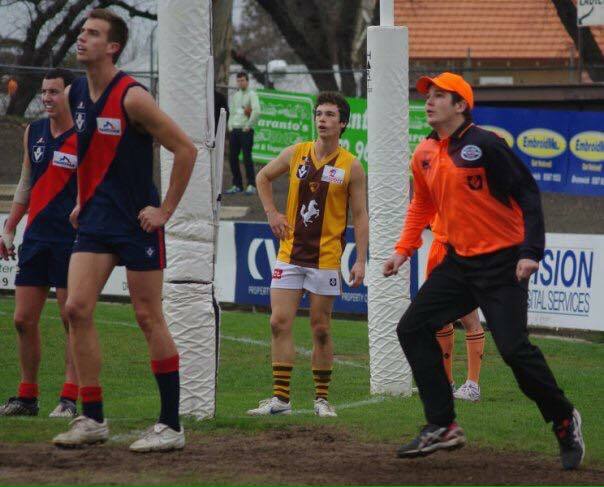 Doyle commenced his career with the VFL in 2006 after doing his apprenticeship at the VAFAUA (Amateurs). Initially the interview with Doyle was going to be “60 seconds with Doyle” but this wouldn’t leave anytime to talk about anything else but his careers stats. Doyle’s stats speak for themselves showing his dedication, tenacity, commitment and passion for goal umpiring. As Doyle reaches 100 senior matches on Sunday he joins an elite club to have umpired 100 senior games including the likes of Balding, Piperno, James, Kyrkou and Nastasi. So Doyle, I’m guessing you picked the top of the table clash between Collingwood and Richmond because you wanted a good match for the milestone? Is it 1 v 2? I picked that match because I live next to Vic Park and didn’t want to travel too far to get there. Guess it might be a good match. So after 12 years at the VFL what keeps you coming back each year? I really just enjoy football. If I wasn’t umpiring, I would be just watching it so might as well get paid to watch it. Plus I’ve enjoyed the friendship, comradery and banter every week at training. Who has been the biggest influence? There have been a number of umpires that have helped me develop my goal umpiring including my coaches and umpires but currently AFL goal umpires Michael Palm and Steve Piperno have been supportive of me and are good friends outside umpiring. Who did you select to umpire the milestone with? I keep telling everyone that I didn’t choose anyone but secretively I picked Callum Leonard. Since commencing on the senior list the same year we have had a lot of banter on and off the track, with some people probably thinking it’s serious. I guess the cream rises to the top and I’ve achieved 100 games before him, so I now have one up on him. What next in the life of Chris Doyle? I’m not sure how many more years I have left in the body as I’m getting close to 40 but I’ll continue to score cricket in the summer and might move into a coaching role, which I have started doing at grassroots recently. With Brad Letson 2nd child on the way I might just step straight into the main gig next year. Congratulations on achieving 100 VFL senior games Doyle. Not an achievement that many umpires reach. A feather in the cap for whatever the future holds. Go well and enjoy the match.